Weeds can be quick to colonise large parts of your lawn and spoil its once-lovely appearance. 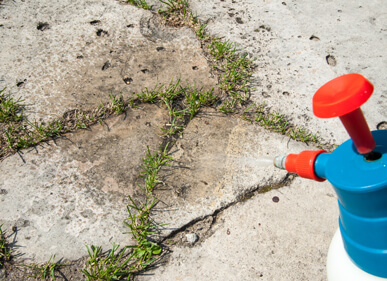 Off-the-shelf weed killers may seem effective at first, but unless you address the conditions that allowed for weed growth in the first place, those weeds will soon grow back! Here at Lawn & Weed Expert, we have many years’ experience providing elite, lasting weed control across Cardiff and the wider South Wales area. Get in touch today for a FREE weed survey. Our weed killing service doesn’t just treat the visible part of the weed – it also tackles the conditions that promote weed growth. As experts in our field, we can devise a weed control plan for your garden that goes on working where other treatments fail, saving you a lot of time and money in the long run. We kill weeds using broad-spectrum systemic herbicides that are safe and highly effective. Our weed control products are not available to the general public as they contain specific active ingredients (such as mecoprop, dicamba and 2,4-D) not usually found in retail products. Certain weeds – like yarrow, field wood rush and celandine – require more than one application. Repeat applications will also control new weeds that grow from seeds carried by birds or the wind (as well as those that were previously dormant in the soil). Weeds are approximately 70% water and will usually decompose completely within 14 days of a Lawn & Weed Expert treatment. Herbicides are usually best applied during periods of vigorous grass growth – such as spring, summer and late autumn – when weeds are growing as well. We can remove weeds from lawns in Cardiff, Swansea, Newport and most other locations in South Wales. Call us today on 0800 111 4958 to request a free, no-obligation weed control survey.